✤ Sale For: You will receive 15 Bags per quantity with all 15 different animals as shown in the image. ✤ Size: Each favor bag measures 5 x 7 Inches. 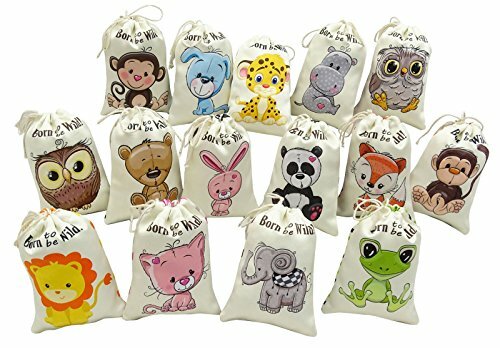 ✤ Born To Be Wild Jungle theme Animal Print Drawstring Pouch For Your Kids Birthday Party. Perfect to add chocolates and other small gifts as return favors. ✤ Made of Heavy Satin fabric with print on both the sides and measures approx 5 x 7 inches. ✤ We need approx 2-4 working days to prepare your order and will be shipped by your chosen shipping method. ✤ If you need any special customization then please feel free to contact us. If you have any questions about this product by Darling Souvenir, contact us by completing and submitting the form below. If you are looking for a specif part number, please include it with your message.